For almost as long as we've had civilization, we've lost it. There are records going back hundreds of years of explorers discovering huge temples encrusted with jungle, or giant pits full of treasure that were once grand palaces. Why did people abandon these once-thriving cities, agricultural centers, and trade routes? Often, the answer is unknown. Here are ten great civilizations whose demise remains a mystery. The Maya are perhaps the classic example of a civilization that was completely lost, its great monuments, cities and roads swallowed up by the central American jungles, and its peoples scattered to small villages. Though the languages and traditions of the Maya still survive up to the present day, the civilization's peak was during the first millennium AD, when their greatest architectural feats and massive agricultural projects covered a vast region in the Yucatán — today, an area stretching from Mexico to Guatemala and Belize. One of the largest Mesoamerican civilizations, the Maya made extensive use of writing, math, an elaborate calendar, and sophisticated engineering to build their pyramids and terraced farms. Though it's often said that the Maya civilization began a mysterious decline in roughly the year 900, a great deal of evidence points to climate change in the Yucatán combined with internecine warfare, which resulted in famine and abandonment of the city centers. One of the great civilizations of the ancient world is called simply the Indus or Harappan civilization. Thousands of years ago, it may have boasted up to 5 million people, almost 10 percent of the world's population, spread over a region that encompassed parts of today's India, Pakistan, Iran and Afghanistan. But its grand walkways (with sophisticated roadside drainage), metallurgy shops, and massive, multistory, brick hives of houses were abandoned over 3,000 years ago. It's likely that this ancient civilization, like the Maya, suffered from gradual changes in rainfall patterns that made it difficult for its peoples to raise enough food for their massive population. The people of Eastern Island represent another classic "lost" civilization, famed in part for its enigmatic, enormous stone statues of human heads (called Moai) lined up along the island's coastline. How did this thriving Polynesian civilization disappear after centuries of monument-building and navigating hundreds of miles of ocean waters to go from island to island? Jared Diamond sums up what many scientists now believe in his book Collapse, which is that the Easter Islanders were incredibly sophisticated, but their methods weren't sustainable. During the time they settled Easter Island, possibly between 700-1200 AD, they used up all the island's trees and agricultural resources, and then had to move on. Often called the world's oldest city, Catalhöyük was part of a large city-building and agricultural civilization thriving between 9,000-7,000 years ago in what is today south-central Turkey. What's interesting about Catalhöyük is its structure, which is quite unlike most other cities since. It contained no roads as we know them, and was instead built sort of like a hive, with houses built next to each other and entered through holes in the roofs. It's believed that people farmed everything from wheat to almonds outside the city walls, and got to their homes via ladders and sidewalks that traversed their roofs. Often, these people decorated the entrances to their homes with bull skulls, and buried the bones of their honored dead beneath the packed dirt of their floors. The civilization was pre-Iron Age and pre-literate, but they nevertheless left behind ample evidence of a sophisticated society, full of art and and public ritual, that was possibly 10,000 strong at many points in its 2,000 year existence. Why did people eventually abandon the city? It is unknown. Long before Europeans made it to North America, the so-called Mississippians had build a great city surrounded by huge earthen pyramids and a Stonehenge-like structure made of wood to track the movements of the stars. Called Cahokia today, you can still see its remains in Illinois. At its height between 600-1400 AD, the city sprawled across 6 square miles, and contained almost a hundred earthen mounds as well as an enormous grand plaza at its center. Its population might have been as much as 40,000 people, some of whom would have lived in outlying villages. The people of this great city, the biggest so far north in Mesoamerica, were brilliant artists, architects, and farmers, creating incredible art with shells, copper, and stone. They even diverted a branch of the local Mississippi and Illinois rivers to suit their needs for irrigation. It's not entirely certain what led people to abandon the city starting in the 1200s, but some archaeologists say the city had always had problems with disease and famine (it had no sanitary system to speak of), and that people left for greener (and healthier) pastures elsewhere on the Mississippi River. One of the most mysterious human structures ever discovered, Göbekli Tepe was probably built in 10,000 BCE, and is located in today's southern Turkey. A series of nested, circular walls and steles, or monoliths, carved evocatively with animals, the place probably served as a temple for nomadic tribes in the area. It was not a permanent residence, though it's possible a few priests lived there all year. It is the first permanent human-built structure that we have ever found, and probably represented the pinnacle of the local Mesopotamian civilization of its era. What were people worshiping there? When did they come? Were they there to do something other than worship? We may never know, but archaeologists are working hard to find out. Most people have heard of the magnificent temple Angkor Wat in Cambodia. But it was only one small part of a massive urban civilization during the Khmer Empire called Angkor. The city flourished during the late middle ages, from 1000-1200 AD, and may have supported up to a million people. 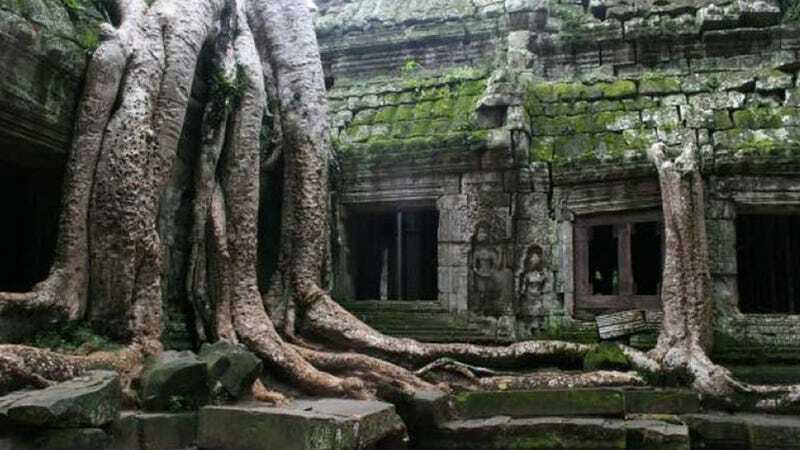 There are a lot of good reasons why Angkor may have fallen, ranging from war to natural disaster. Now most of it lies beneath the jungle. A marvel of architecture and Hindu culture, the city is mysterious mostly because we still aren't certain how many people lived there. Given all the roads and canals connecting its many regions, some archaeologists believe it may have been the biggest urban site in the world at its height. Though not every crumbling monument represents a lost civilization, some of them do. Such is the case with the Minaret of Jam, a gorgeous architectural feat built in the 1100s as part of a city in Afghanistan, where archaeological remains suggest that it was a cosmopolitan area where many religions, including Jews, Christians, and Muslims, lived together harmoniously for hundreds of years. It's possible that the incredible minaret was part of the lost medieval capital of Afghanistan, called Turquoise Mountain. Now a desolate spot in the Taklamakan Desert of Xinjiang province in China, 1600 years ago Niya was a thriving city in an oasis along the famous Silk Road. For the past two centuries, archaeologists have uncovered countless treasures in the dusty, shattered remains of what was once a graceful town full of wooden houses and temples. In a sense, Niya is a relic of the lost civilization of the early Silk Road, a trade route that linked China with Central Asia, Africa, and Europe. Many groups traveled the Silk Road, from wealthy merchants and religious pilgrims to scholars and scientists, exchanging ideas and creating a complex, enlightened culture everywhere the 4,000 mile Silk Road passed. The route underwent many changes, but its importance as a trade route waned as the Mongol Empire collapsed in the 1300s. Traders afterwards preferred sea routes for trade with China. From 7000 and 6500 BCE, an incredible urban community arose in what is today the Egyptian Sahara. The people who lived there domesticated cattle, farmed, created elaborate ceramics, and left behind stone circles that offer evidence that their civilization included astronomers as well.Archaeologists believe the peoples of Nabta Playa were likely the precursor civilization for the great Nile cities that arose in Egypt thousands of years later. Though the Nabta civilization is today located in an arid region, it arose at a time when monsoon patterns had shifted, filling the playa with a lake and making it possible for a large culture to bloom.